KYOCERA Net Manager is a Kyocera software product with response to the increasing consumer demand for more control of data and information flow. As an extension of the Active Directory authentication feature with ID card in TASKalfa devices, KYOCERA Net Manager provides an integrated and transparent environment for printing/copying/scanning/sending operations. Copy machine is locked in the default status. After login through a valid identification item the panel is unlocked and the copy function is enabled. When the user completes the copying process he/she logs out by entering the identification item. The number of copied pages is counted in the system. User sends a job to print. The job is processed and verified the rights by the system and is immediately sent to an appropriate printer. With the direct printing function no terminal is needed. User sends a job to print. The job is processed by the system and is stored on the server. After the user logs in on one of the printing devices the job is sent to this printer device. Secured printing function enables to print on any associated printer regardless of the place from where the job was printed (so called Print & FollowTM function). After login by the ID card, all the scanned jobs are automatically sent to a shared folder, or to an email of currently logged user. User does not need to set any destination folder or to select an email address. KNM now supports OCR into the scan management process user receive his/her scanned data in the editable format. 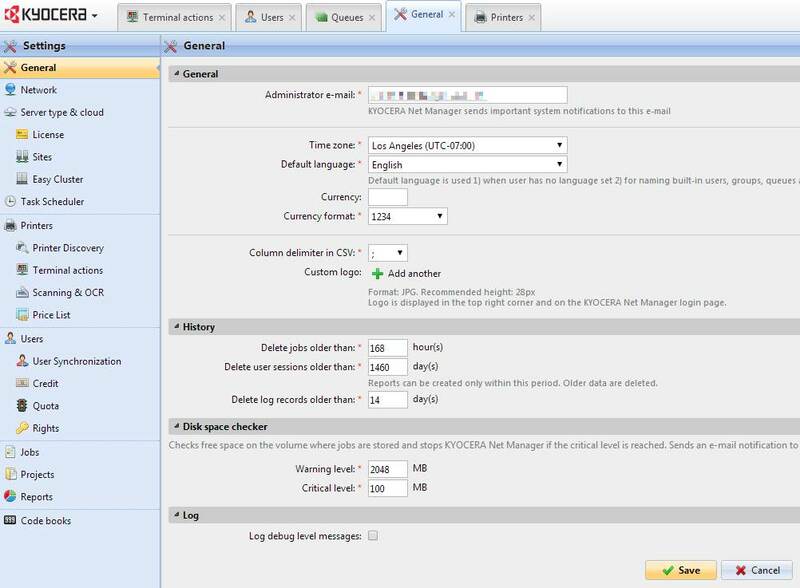 Enables an automatic import of users from MS Active Directory, Novell eDirectory, Open LDAP, Lotus Domino or CSV file. During User Import, Random PIN no. will be assigned and sent to user automatically by email. KNM monitors current status of all printing devices, displays error/warning messages and graphically displays the actual toner status. It regularly updates counters of all the functions. The KNM print solution offers automatic report sending in a chosen period of time. Great variability in report setting enables to send proper information to individual users. Reports can be displayed online on KNM WEB interface, periodically send to the different email addresses or stored to predefined folders. More than 60 reports based on printers, departments, users, jobs or projects are available in PDF, HTML, XML and CSV formats. Quotas for printing and copying protect from misusing of print service by users. For each user a quota (limit) can be set flexible time period or repeated period. If the limit is exceeded the system enables/disables printer. The quotas can be set according tototal number of pages, color pages or price of prints for a certain period of time. Automatic sending a notification while the warning level is reached or while the quota is reached. Project accounting function on Embedded terminals allows to assign print project to data coming from any OS without the need of any additional application. If KNM is installed to more branches, collecting data from KNM branch servers and displaying the data on the master server is possible. For Embedded HyPAS devices, it provides a intuitive with large function icon for users with minimal learning time and effort. The Embedded Terminal Lite will allow to authenticate at the device for e.g. copy, scan, fax and securely release all print jobs in the queue by native connected Kyocera USB Card Reader.